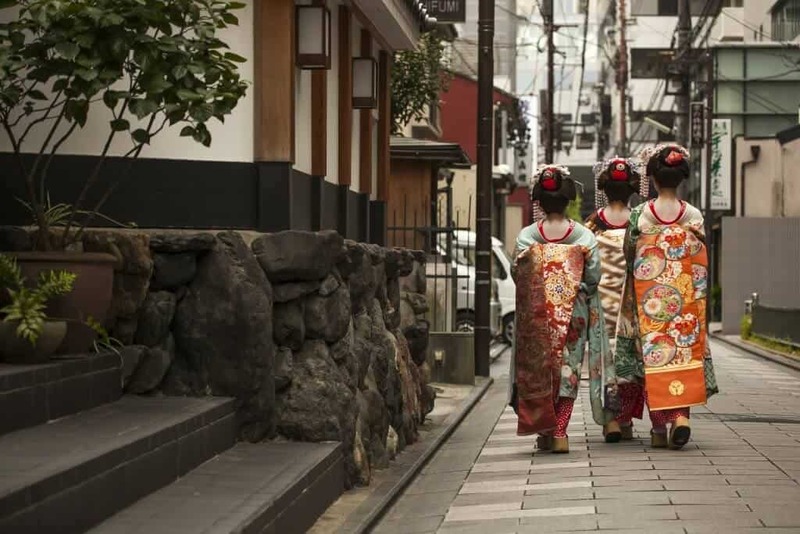 There are so many amazing things to see in Kyoto. 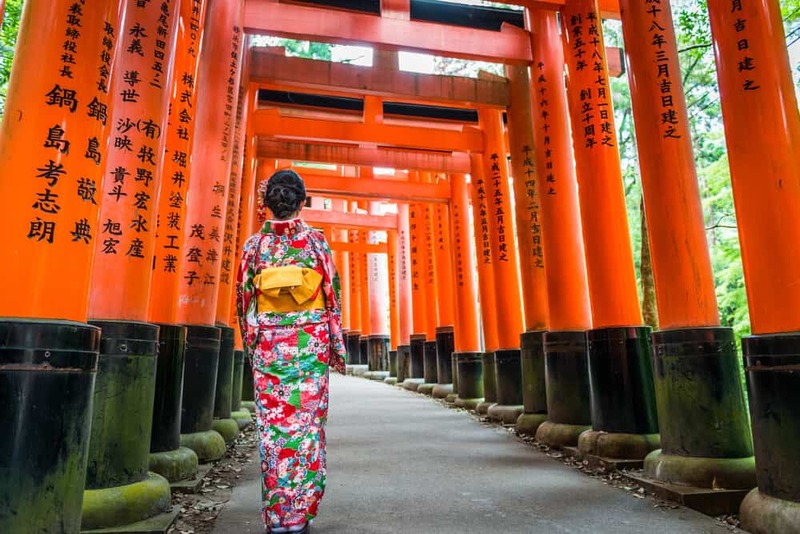 It’s one of the top tourist destinations in Japan, and somewhere you could spend a whole week and still barely scratch the surface of what it has to offer. 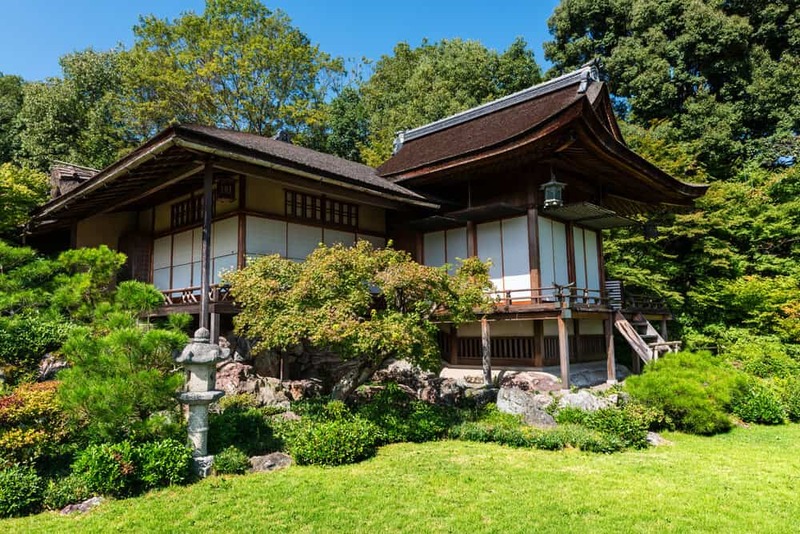 Arashiyama is one charming area where you could easily spend a whole day, and less than half an hour away on the Randen street car, it’s easy to get to for day-trippers. 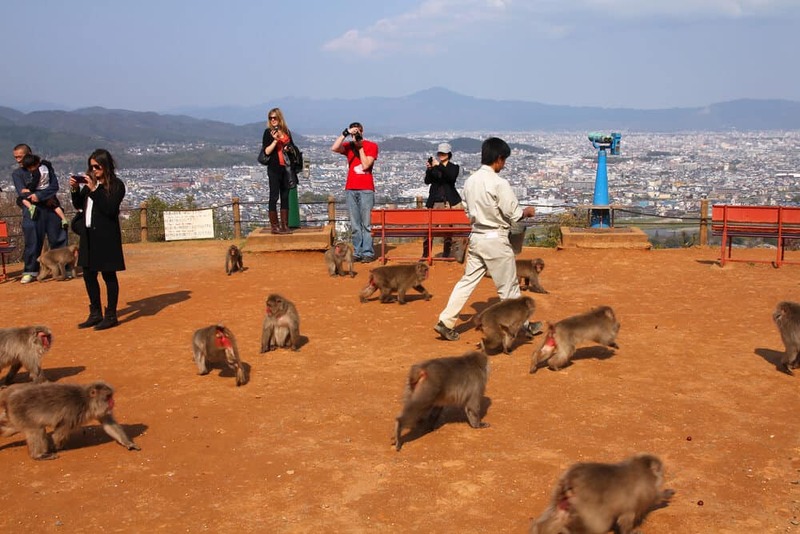 One of the top attractions in Arashiyama is the monkey park. 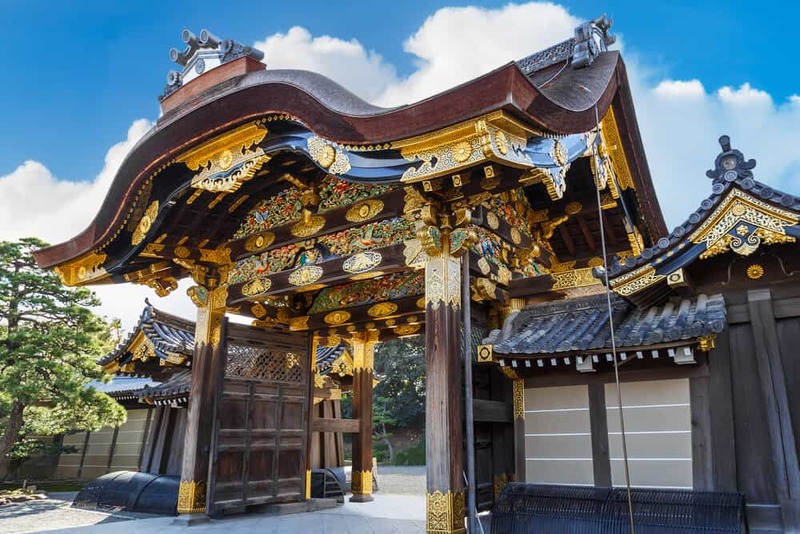 Visiting the Iwatayama Monkey Park in Arashiyama was one of the highlights of my trip to Kyoto. The monkeys are fascinating to watch, entry to the park is very reasonable, and the view from the top was spectacular. 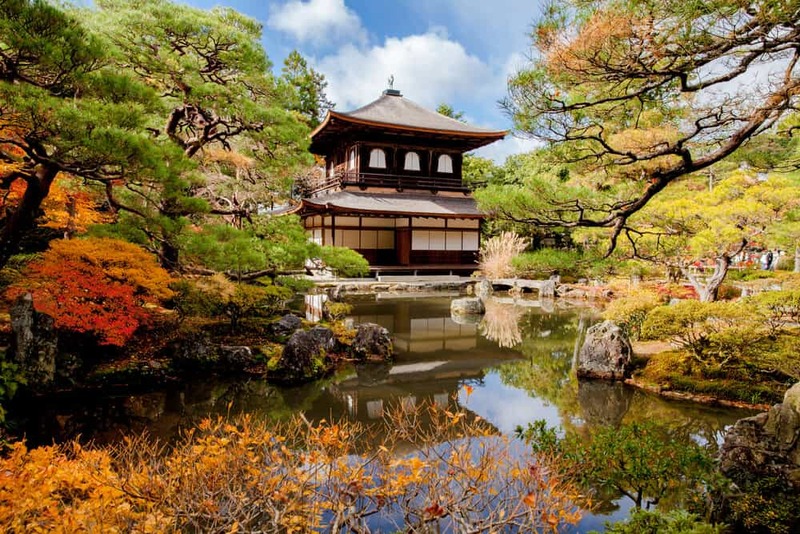 If I lived in Kyoto, I’d certainly buy myself an annual pass and visit all the time. 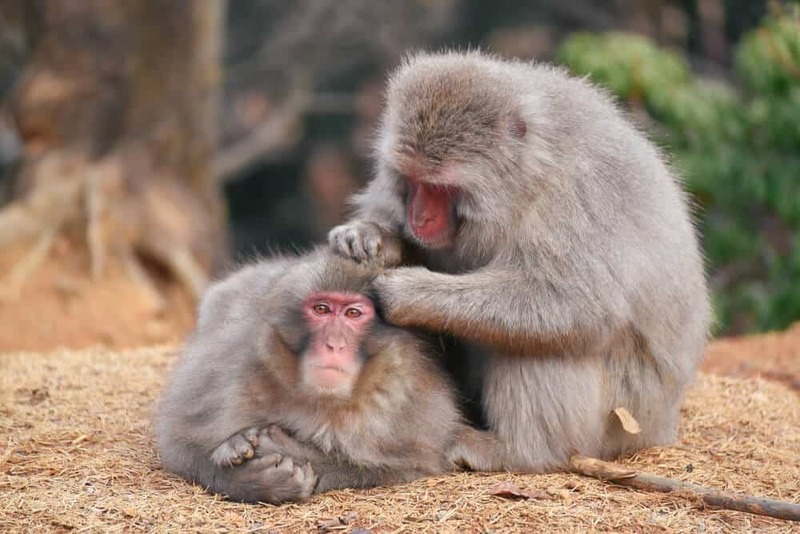 The Iwatayama Monkey Park is home to around 170 Japanese macaques, which are known as snow monkeys. You’ve probably seen famous images of these monkey’s relaxing in natural hot springs – they love a good onsen as much as we do! 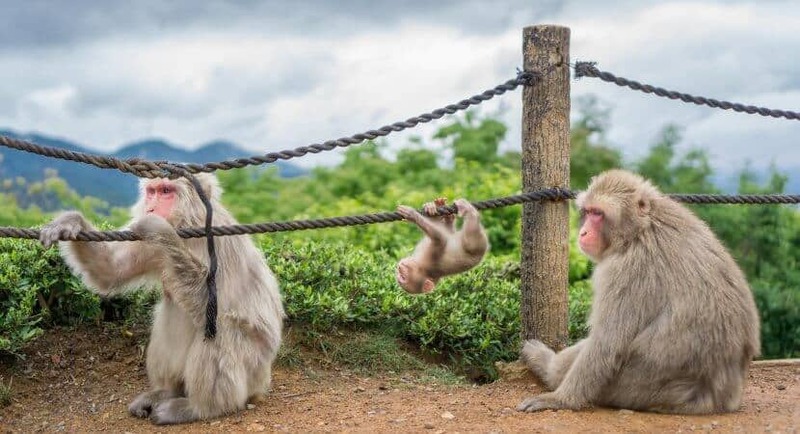 However, this practice is seen more around the north of Japan where it’s much colder, and so the monkey park in Arashiyama isn’t equipped with hot springs for the monkeys. The macaques are easily recognized by their dark pink faces and behinds, which are even more brightly colored during mating season. The park has extensive grounds but the monkeys usually only congregate right at the top of the mountain. The path to the top is pretty steep and on the usual route it takes about thirty minutes to reach the top. If you’re pressed for time, when you reach the fork in the paths near the mountain top, turn away from the usual route and instead go up the steps to the left – this way is much quicker to the top even though it looks like a bit of a climb. 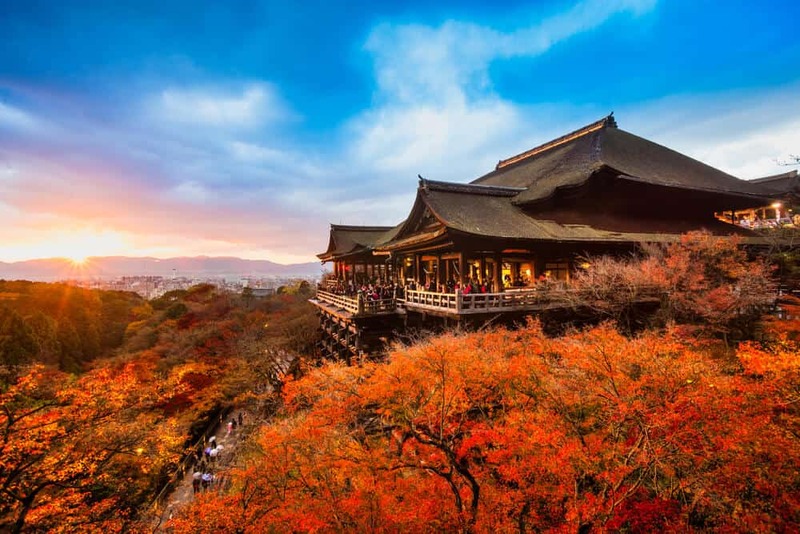 Aside from the seeing monkeys, at the top of the mountain you’ll also be treated to a spectacular view of Arashiyama and Kyoto in general. It’s quite a steep walk to the top, but worth it for the scenery. Be sure to have your camera ready for plenty of scenic shots. Speaking of cameras, be sure to observe the rules at the park to keep yourself safe around the monkeys. The animals run wild on the mountainside, and while they are usually gentle creatures, they are easily provoked if you don’t observe the rules. There are attendants at the park to keep an eye on things and chase away the monkeys who are reacting badly to visitors, and also to keep an eye on the visitors who aren’t observing the rules. Other regulations include not making eye contact with the monkeys (this is very provocative), not pushing cameras in their faces, not trying to touch the monkeys or feeding them any food you’ve brought with you to the park. 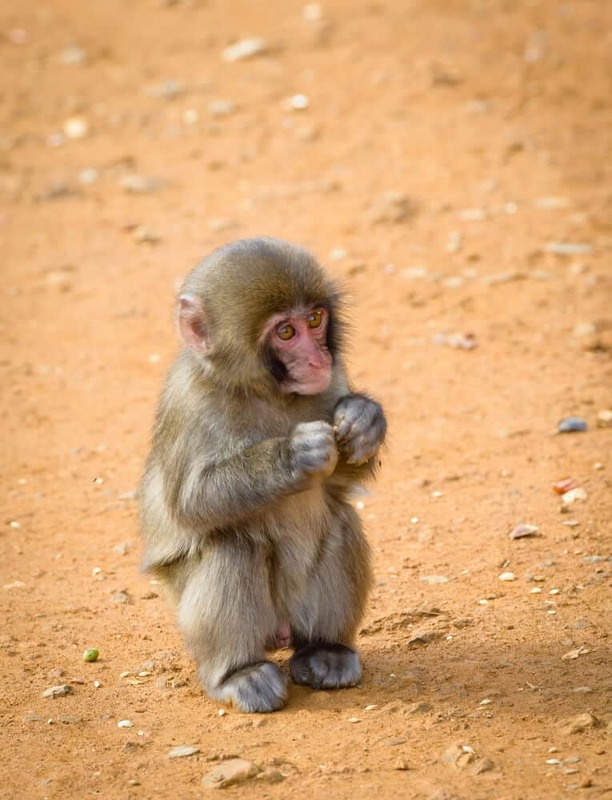 If you do want to feed the monkeys, purchase a little bowl of macaque-friendly food from inside the hut. They are partial to nuts, bananas, and apples, which you give them from inside the hut though a cage. This is a very clever design which keeps guests safe from the potentially dangerous animals. The hut is like a big cage with people on the inside, and the monkeys stick their arms through the bars of the cage to get the food. 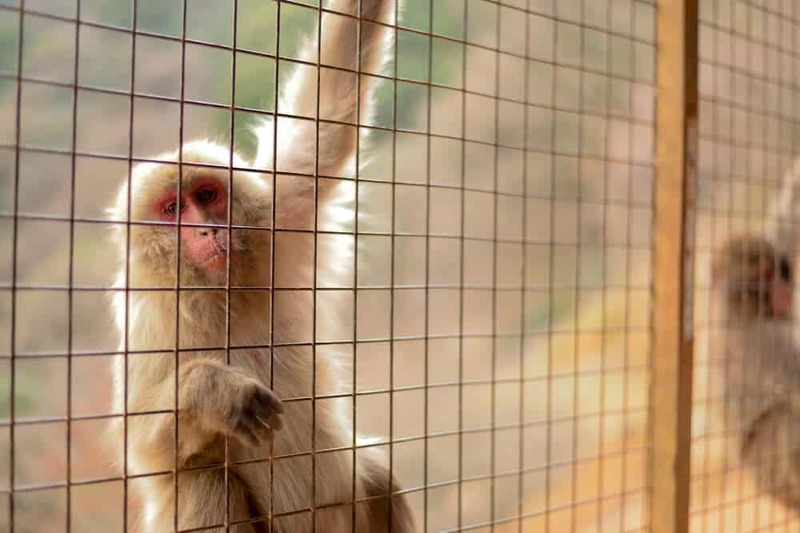 In this way, guests can enjoy feeding the monkeys without getting too close to them or risk getting bitten. I thoroughly recommend this experience. Their hands are so extraordinarily similar to human hands, and watching them push each other out of the way to get the best spot at the window is always entertaining. In the summer the park is open from 9:00am to 5:30pm, and in the winter from 9:00am – 4:30pm, with the ticket desk closing thirty minutes before closing time (as it takes a while to reach the top of the mountain after buying your ticket). The entrance to the monkey park is just up the stairs. If you live nearby, consider purchasing a year pass to visit whenever you like. 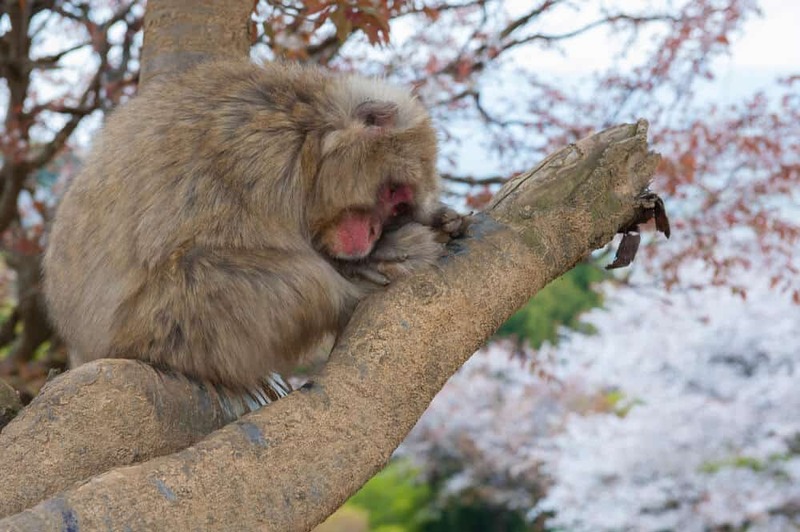 If you get to Arashiyama by train, it’s only a short walk to reach the monkey park. From the station, walk down the road to the Oi River (Oi-gawa) and cross to the other side. Just over the bridge, as the main road bends around to the left, take a right, and you’ll see steps leading up the mountain on your left. It may seem like a perfect selfie opportunity to crouch down in front of a group of monkeys, but this is actually really dangerous. You shouldn’t get down on the same level as the monkeys as this can agitate them, and if you have your back turned to them for a selfie, you’re obviously putting yourself in a vulnerable position. During our visit we saw one young man doing just that, resulting in the monkey behind him getting very upset and charging him. 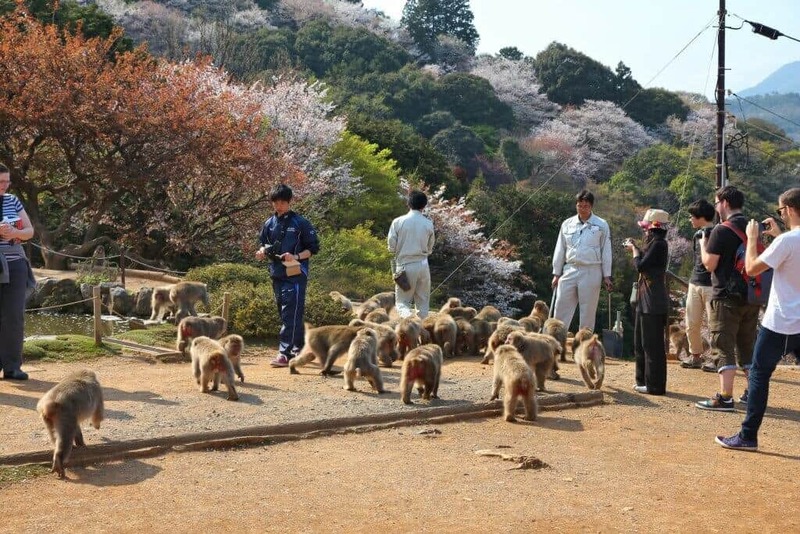 Have you visited the monkey park in Arashiyama, or a similar park elsewhere in Japan? Leave us a comment and let us know what you think about this unique tourist attraction. 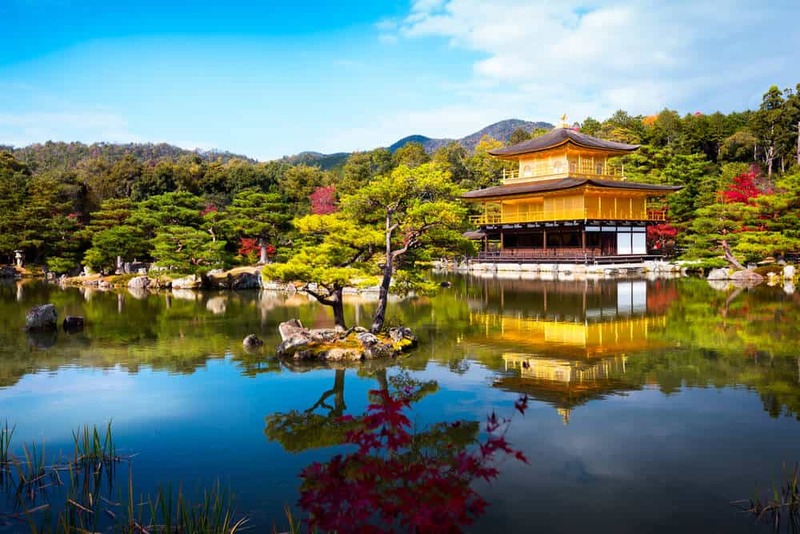 Celia Jenkins has taught English in China, Japan and the UK to students from all over the world. Coming from Guernsey in the Channel Islands, she likes small, quiet places where she can squirrel away and get lost in a book. As well as teaching, she is also a professional writer and part-time knitting enthusiast. Osaka Station City: Shopping and Food Galore!